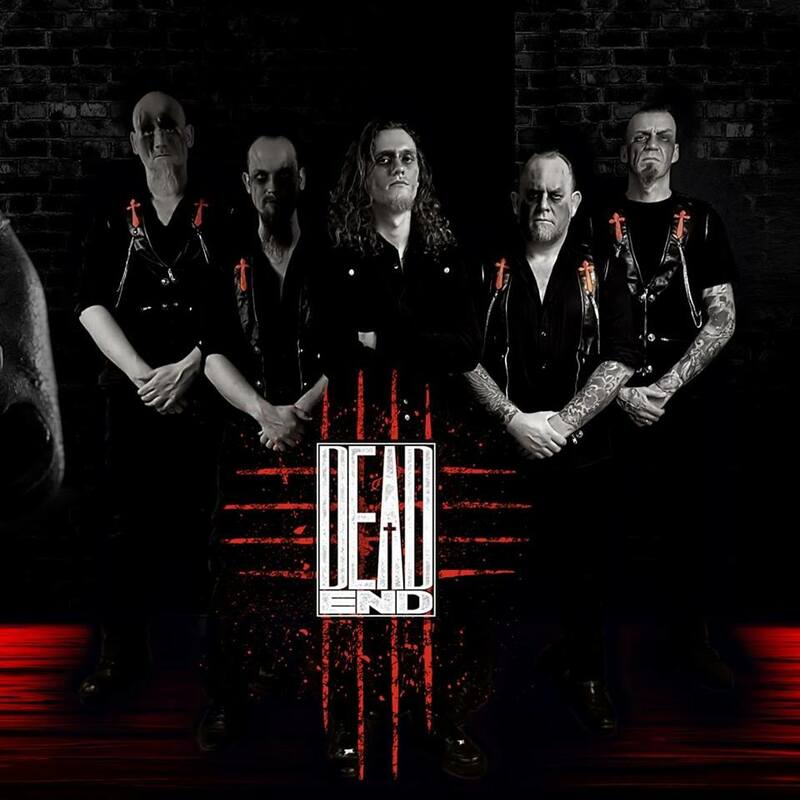 Alwin has played in Wish and Morthicia after the original Dead End split up. How is it that you started playing music? For me it was a passion, I was constantly listening to music and all kinds of bands until I thought; "I want to do this, I want to make music". The only one stopping you from doing that is yourself, so I just started doing it, walked up to some random people who had a band but no singer and we just went for it. Had a few fun years with them until moving on to Dead End. After the restart Jeroen R. and Günther together with Alwin, myself and Jeroen G. were the reincarnation of the band, after half a year Günther and Jeroen R called it quits so Arjan and Harald claimed their respectable positions. Did you make music even when you were young? Not really, I've gotten more into music in my late teens. I did sing a lot when I was young. What year did the band form? 1988 but disbanded in 1993, then resurrected in 2014. What inspires you? Oh all sorts of things. Some songs are about overcoming certain tribulations or struggles. Or some songs describe certain emotion and states of mind. How often and where do you reherse? The band rehearses almost every week and we have our own place to play and record the music. How have you developed since you started with the music? I've been less insecure after performing for this long, it made me stronger. Do you have other interests of work outside the band? I work in an office outside of the band. Finance work. Other interests I have are horror movies, video games and music festivals. Are you looking for a booking agency, and what are your thoughts around that? We are not looking for a booking agency, but we are always open for new contacts as we arrange our bookings ourself. Are you looking for a label, and what are your thoughts around that? We are not, but contacts are always welcome. What are your songs about? about overcoming certain tribulations, struggles, certain emotion and states of mind. Who does the composing and writes the lyrics? The composing mostly happens in the rehearsal room, but Arjan frequently creates riffs from home. Do you start with the music or the lyrics? Often start with the music and then I base lyrics of the song. But there were occasions that I had some lyrics around that just seem to fit with a song just fine. Do you compose in a certain environment? Yeah, I need to be in the right mindset to write. Preferably in the right atmosphere too. Preferably dark with a few beers. Have you done any covers live? We have done "Slowly We Rot" by Obituary a few times live. What are the least and most people to attend one of your gigs? That's difficult, we've had shows around the 10-15 people and packed houses, unsure of the numbers. What ages are most of your concert attendants? Mostly people in the late 30's. and 40's. They are the real old school death metal crowd. But we frequently see some young people too, which is awesome! Do you always play the same songs live, or do you vary? We recently switched guitar players so we often play the same songs now. But over time this will expand more. Do you have a regular place you play live often? Not really, we play everywhere. What was your first gig like? I was pretty nervous at first but it got comfortable really fast. What was your latest gig? It was pretty fun, we played in Gorinchem and while it wasn't very crowded the audience was active and that's what counts in my book. Where have you played live this year? In 2018 we have played in the Netherlands, Germany, Belgium, Austria, Czech Republic, Malta and Iceland. Where do you plan to gig the coming year? Can't tell much about it, but we're planning to play a lot more abroad. When did you start to sell merchandise, and what do you have for sale? From the start and we seem to be quite succesful. New merch tend to sell out pretty quickly. Where can people buy your merchandise? But we like to have people come to us after the show for a chat and some merch. I personally don't really mind, I just love it when people just listen to us, on Spotify, YouTube or whatever. But it does hurt bands a lot financially. I get it, records are expensive and with the large large amount of bands around these days, it's easier to just listen to music on YouTube or Spotify. So at least go and check the bands out live in your area. It helps. It didn't really hurt the big bands I think. They adjusted their price to get booked for gigs and because of that a lot of ticket prices are more expensive too. This makes it more difficult for smaller bands to make a little bit of profit of their music. Being a musician is expensive, but we do it because we love it so much we are willing to take the loss. What do you think of my work? I'm not familiar with your work, show me something. How do you think and know that this interview will help you in the music business? I'm not sure, I just like to talk about music and meeting new people. For the rest, I'll just see where I end up. Do you have any role models or idols? Not really, we're all just people and while I can admire how some people are, I don't see them as role models or idols. Some artists inspired me and I would like to inspire others too. Is it easier to find inspiration from older bands, or bands that are more active today? I think older bands, especially bands you grew up with. They left you with the biggest impression. What have been your biggest obstacles? My own fears and insecurity's. What advice would you give other bands or artists? Go out there and work hard. Focus on the positives and stay yourself. How do you get psyched for a gig? When I'm travelling to a gig I get excited already. Meeting new people, go crazy again. Do you have any new material? We released our latest album "The Mind's Asylum" at the end of last year and we are currently writing new material. How can people reach you? They can reach me and the band personally through Facebook. I use my own profile almost exclusively for music so if you find me, have a chat. What are your plans for the future? Not sure, I'd like to grow bigger and play bigger shows. See more country's and meet more people. Make sure to check us out whenever we are in the area and of course check us out on all music platforms.